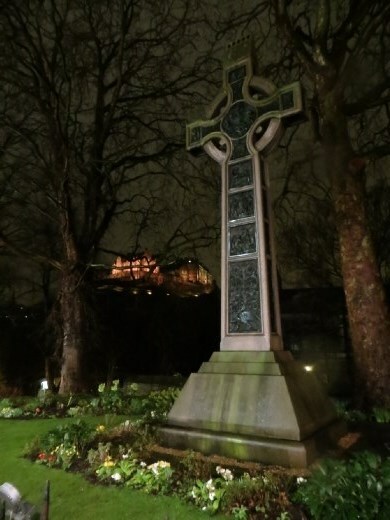 My last photo of Edinburgh is almost my favourite. Scotland has so thoroughly pampered my senses that writing about it soon after leaving, I feel like I should be relaxing with a cigarette and praying the neighbours were asleep. 'Touch' is probably the only sensation that hasn't been lured into loving Edinburgh like the Sirens were excellent bagpipe players. It makes me feel like a dirty cheating scumbag as Istanbul is going to make me sleep on the couch if she catches wind of how Edinburgh has charmed me. I felt anything but charmed being snored awake again at 5am, but coffee is more than a fitting compensation for any of lifes challenges, and even sleep deprived I couldn't help but wander the town with a lovers grin glued on my face. I had to find a tour operator open early as I had decided a tour was my only option at 10:02pm, 2 minutes after they all closed the previous night. The bad luck had ended at 3 dumps on my plate by Lady Luck and the tour I chose at random turned out to be a winner. Murray was the guide and sported a kilt and a Billy Connolly type sense of humour that not only kept me entertained the whole day, it made me confident that if a dude in a man dress can handle the cold, I can tough it out wearing a jacket overloaded with the pluckings of woodland creatures. 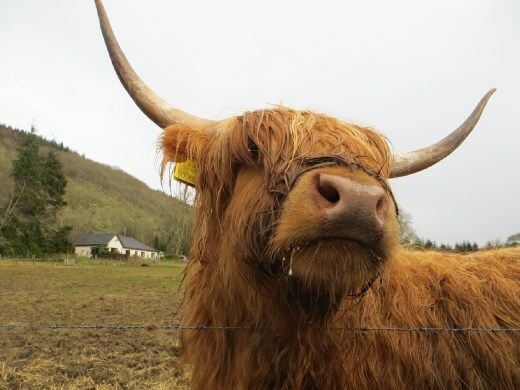 I feared a total lack of comprehension when encountering the Highland accent and if a tour guide couldn't speak legibly, I might as well just leave the country. Me understanding Murray calling the sun an invasive species and not native to the highlands humourously summarised all the aspects of this paragraph. After 2 hours of driving, our first stop was in Callander, the gateway to the Highlands. Looking back the way we came, a patch of blue sky was still visible, but our path ahead lead us into some pretty bleak and scary looking clouds. All the mountains were still covered in snow, and the taller ones remained hidden behind the low lying clouds they had attracted like moths to a flame. Rivers of blue slate rubble had avalanched down every mountainside, harvesting themselves as valuable building materials and leaving only the assembly of abodes to human hands. Also giving the Highlanders more time to slaughter each other is the multitude of trees that have felled themselves, as snow laden, a strong breeze is enough to uproot their tenuous hold on the thin soil than covers the solid rock underneath. Like Gallipoli, such amazing natural phenomena was soaked with blood as the Scottish clans had survived the harsh conditions by ensuring there was less competition for the limited resources. After Scotlands gruesome history and the atrocious conditions of Gallipoli, the next tour I do will be of Disneyland, a nursery, or most likely, a brewery. If I had a choice though, I wouldn't do any tours, even though they are far more informative than driving around yourself constantly cussing out the local cartographers. A tour is just like any bus trip somewhere except it costs three times as much, you feel more obligated to look at the passing scenery, day dreams are routinely interrupted by random facts and your starting point conveniently doubles as your destination. It wasn't long into the trip that the snow started to fall and I gave thanks that I wasn't actually driving through conditions I had never encountered before. Any form of precipitation was sporadic and there was enough breaks to see most of the beautiful countryside we were speeding through. With a day to cover so much ground, a lot of incredibly interesting sites had a tale told about them as we gunned it past. The Monty Python castle referenced in the previous journal was definitely one that deserved more than a rapid shutter drive by. It highlighted the experience/evidence paradigm in that without photos of what was happening, does it negatively impact upon the poignancy of the memory? If I don't have a selfie of it, did it actually happen at all? Ancient Zen koan right there people! 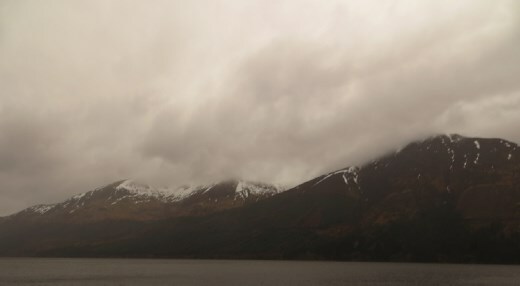 I passed up on a £17 add on of a cruise around Loch Ness as the constant rain on approach meant Nessie would have to hop into the boat to be seen. That gave me plenty of time to stock up on cheap Chinese crap that had something to do with Scotland and drink 6 free samples of Scotch before the lady came over to inquire if I was going to buy anything or just get blotto right there in front of her. I opted for a 50ml bottle of Scotch honey liquer that wasn't so much a rip-off when you factor in that I had just drank three times that much for free. I befriended the two Finnish girls sitting opposite me on the bus and a couple of delicious stouts in their company was the perfect way to end a day that had delighted my eyeballs with so much incredible scenery. The third day was a bonus day in Edinburgh, but had come at the high cost of missing out on the Brewdog brewery. That could be rectified with a visit to the local brewdog bar, the second of 27 to have opened. That is an endeavour best approached sober but a tour at The Whisky Experience was permissable because I love contradicting myself about not doing another tour and it would take more than a few drams to push me past sober. I had wanted to visit a real distillery, but that plan had succumbed to my stupidity as well, so with one of the Finnish girls accompanying me, we took the slowest and least scariest ride in a barrel through an imitation distillery. That was actually extremely interesting and educational and our friendly and discerning guide Gavin gave me good cause to further reconsider my position on tours. His obviously sound sense of judgment had pegged me as a gentleman of distinction, largely because of my Australian tendency to just shout out when other nationalities remain silent in groups of strangers. Scotland has five very distinct areas of Scotch production and a scratch and sniff style test had endeared me to Gavin when I shouted out anything that came to mind while smell testing the characteristics particular to each region. Based on that, we chose a region to sample and no matter how much of a rapport I forced upon Gavin, he couldn't be convinced to give me extra samplings. 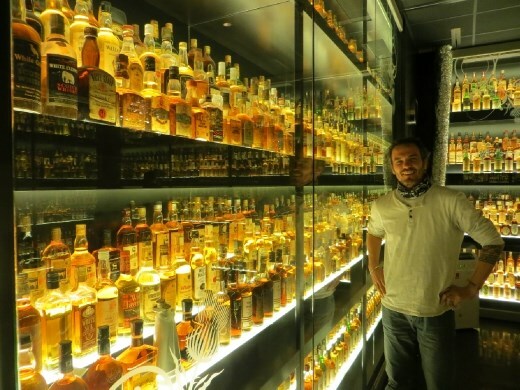 Upon entering a room holding the largest private Scotch collection in the world, I implored the Finnish girl to distract Gavin while I figured out a way to rescue some bottles whose age and uniqueness would put their value beyond measure. One dram certainly had no effect on my brewdog aspirations, but made me a lot more interested in tasting my way to a better understanding about whisky production. More important drinks awaited and for any of my non craft beer loving readers who are probably sick of my gushing praise for Brewdog, I won't detail what was enjoyed this night. Needless to say my tongue will never forget the loving caress of so many delicious beers that makes Scotland worth visiting for it's most famous brewery alone. With sight, smell and taste accounted for, it was time to end my stay in Edinburgh with a treat for my ears. 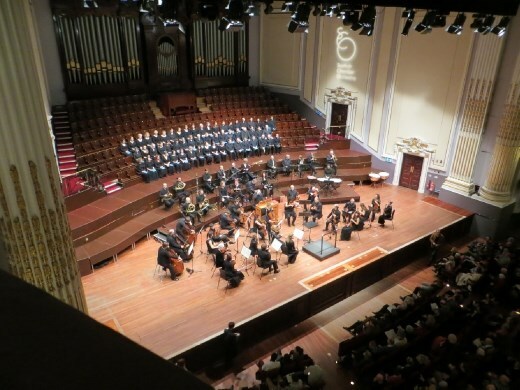 I had been lucky enough to jag one of the few remaining seats at Usher Hall to hear the Scottish Chamber Orchestra perform Mozarts Requiem and Schuberts 8th. Making my way to my seat on decidely shakey legs, I couldn't believe how close I was to the action for just £15. I took a lot of photos and even some movie footage because you just simply couldn't afford seats this good at a classical concert in any other city. And I couldn't afford these seats in Edinburgh either unfortunately. With the usher preoccupied, I had helped myself to what I thought was my seat, aided somewhat by brewdog when it came to finding where I was going. I was ready to mark my territory with a few hopefully quiet seat warmers when an old lady came up and thanked me politely for keeping her seat for her. This wasn't the Oscars so I knew something was amiss, other than this being a dry event. Turns out I had overlooked the biggest and most important text on the ticket that said my seat was one of the ones closest to the roof. Up a level I went and the elevated view also gave me a close up of the rail in front of my seat. “No bother” thought I, as it was more about the sound anyway. And what a glorious sound it was. Usher Hall may have lacked the acoustics of some of the better venues I had heard classical music being played in, and it aesthetically couldn't compare to even the front door of the Leglise de la Madeleine. The performance was still amazing and passed by quicker than my rapidly sobering brain could fully grasp its sublimity. Back I wandered to the hostel in the drizzling rain, never before being so unaffected by adverse weather conditions. Ireland is the last stop on my European jaunt and it has a lot to beat given all that has come before it. Although missing out on visiting the Brewdog brewery almost negated my reason for being in Scotland, the need to return to visit it will give me another opportunity to fully grasp why Edinburgh is one of the most amazing cities I have visited.